It is only fair to warn you that today's tale is a grisly one; it's a story of adventure, exploration and cannibalism. If you've just sat down to tuck into a fine roast joint, my story of the death of French explorer, Marc-Joseph Marion du Fresne, might not be the ideal accompaniment to your meal. Du Fresne was a man with a love of adventure. A former naval commander, he knew the oceans well and had sailed on the French East India routes on multiple occasions without incident. When the Company dissolved in 1769, du Fresne set sail for the southern seas with the aim of chartering new territory and discovering new lands. In fact, new lands would be the least of what lay in wait for him. Initially the expedition met with some success and du Fresne discovered the Prince Edward Islands and then the Crozet Islands before heading on to Australia and then New Zealand. Here they anchored in the Bay of Islands and made peaceful contact with the Maori who inhabited the area. The French and the Maori appeared to co-exist peacefully for around a month, with the sailors cataloguing the behaviour of the indigenous people, who in turn allowed them access to their settlements and fishing areas. The French set up a medical camp on Motorura Island under the command of officer Jean Roux and here they treated sick crewmen and established themselves. Du Fresne was welcomed into the Maori village and participated in ceremonies held in his honour yet alongside all this bonhomie, conflict was brewing. For reasons that will never be known, the Maori began to resent the presence of the French explorers and scouting groups were found on multiple occasions in the vicinity of the hospital camp after dark. When du Fresne heard of these incidents he dismissed them, sure it was simply Roux being needlessly suspicious. Perfectly happy and believing he had nothing to fear, on 12th June 1772, de Fresne left camp with a group of crewmen to undertake a fishing expedition. He did not return and that same night 400 armed Maori attacked the medical camp, only to be held back by French firearms. It has been suggested that du Fresne's men made the mistake of fishing in a sacred area on the day of his death or that they had done so on multiple occasions earlier, leading to a simmering resentment that exploded. The reasons for the sudden outbreak of hostility are lost to time now, but the outcome was to prove fatal. When this attack was over it became apparent that this was far from the end of hostilities. A badly wounded survivor from du Fresne's fishing party found his way back to his comrades and revealed that the Maori had ambushed their group, killing the men where they stood. It was the start of a series of conflicts culminating in a battle in which the French were forced to defend their camp against an attack by over a thousand Maori. Armed with blunderbusses, two dozen French held off an attack and in doing so, killed the Maori chief, Te Kauri. During the attack the French saw that some of the Maori were wearing the clothes of their dead crewmates. They killed hundreds of the tribe and those who remained fled in fear of their lives as the Frenchmen stormed through their villages in retaliation. The French explorers left the island as quickly as they could, delayed for a time by ongoing repairs to their vessels. When Roux examined the now deserted village that the crew had laid waste to following the conflicts, he made a grisly discovery. Around a campfire were bones that had been picked clean as well as the head of one of his crewmates displayed on a stick. 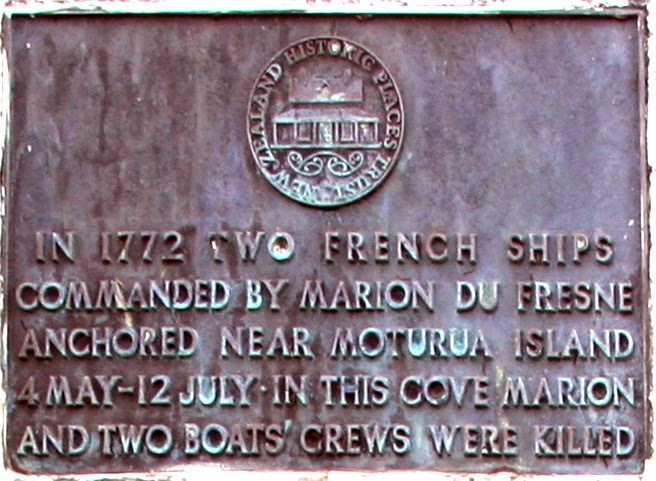 Twenty six Frenchmen lost their lives and hundreds of Maori perished that fateful summer; it was Roux's summation that his commander and crewmen had ended up as dinner for the Maori who had once welcomed them to their land. Once the French were established on the island, it does seem as though they were pretty much *business as usual*; a little more cultural sensitivity would not have gone amiss, I suspect! What a grisly story.What happened to Roux after his fateful voyage? He was promoted to lieutenant and continued his career, fading in the records!